Check-In Time: 3:00 P.M. Check-Out Time: 9:00 A.M.
Rates do not include 7.375% sales tax. We accept checks or cash. Sorry, no credit cards accepted. A $250 per week deposit will hold your reservation. We will hold a reservation made by telephone or email for 7 days, to allow for your deposit check to arrive by mail. If you cancel your reservation, we will refund your deposit if we rent your entire reservation to another party. Your reservation is not transferable to another party without permission. Guests are responsible for the cost of the entire length of their reservation. There is a two-night minimum stay for all cabins. Bring a kennel for your pet, and keep it in the kennel at night and when no one is in your cabin. When walking dogs, stay on resort property or on the pavement and gravel surfaces of public roads, stay off neighboring private property, and pick up after your dog. Pets must be on a leash at all times when outdoors and cleaned up after. We do not allow dogs in the swimming area, but you are welcome to use the “Dog Beach” between the docks. Please bring your pet’s own bedding, and keep pets off the furniture and beds. 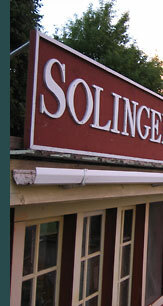 We offer housekeeping cabins at Solinger's Resort, and an important part of the rental agreement between us is that you "keep house" and complete the list of basic and reasonable cleaning tasks posted in the cabin before you check out. Observe our quiet hours; 11p.m. to 8 a.m. Please drive under 10 mph on resort driveways for the safety of pedestrians, especially the children. Only Minnesota-legal fireworks allowed. Children age 12 and under: $15/night, $75/week. Infants under one year old stay free.